Everyone registered gets their very own online fundraising portal. Go ahead, use it! It is one of the simplest and most effective ways to kick-start your fundraising. To access your portal, click the LOGIN button in the top right hand corner of this website. Enter your username and password from the registration confirmation email we sent when you registered. If you forgot your password, simply click ‘Forgot Password’ and you will be sent an email to reset it. Upload a profile picture – everyone loves to see a smiling face! Spread the word on your social media platforms – it is as easy as a click of a button! You’ll be surprised at how easily it can encourage people to donate. Through the ‘Messages’ tab, you’ll be able to send emails to your friends and family (and track who has opened them!) We’ve set up some templates for you to make it super easy. What you’re doing is great, you should let everyone know about it! 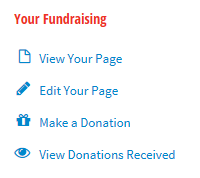 Your donations tab will show you all the details you need to know about who has made donations (and help you to thank them as well!) If you need to add any offline donations, here is the place to do it. Decided you would rather join your mates? 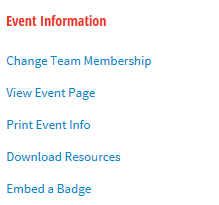 Through the Dashboard option, you’ll be able to change your team membership. From here it is nice and easy, to create a team of your own or join an existing team. Need more info? We can help! Contact us.